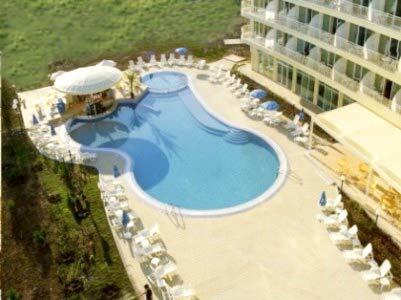 Built in 2004, the Wela Hotel complex offers to its clients high service standard responding to 4 stars quality. Just returned from a week staying at the Wela Hotel and had a brilliant week there. Hotel room was nice and clean, made breakfast twice it was ok, had a couple of lunches there too and it was nice enough. The Night Bar was great especially being open till 5am, great laugh, great barmen and great Sambucas !!! Would go back in a minute and hope to next year. Have just returned from two weeks at Wela Hotel. Facilities are fantastic, staff very friendly & always helpful. Breakfast was good. Access to beach just a 5 minute walk, but pool area is excellent. Would recommend this hotel to anyone! 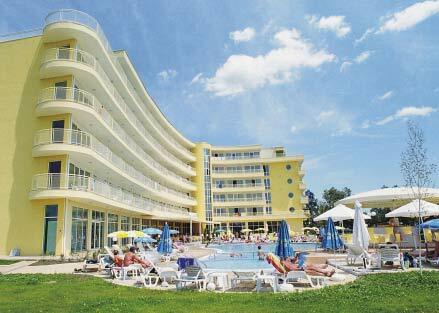 Just returned from a 2wk stay in the Wela Hotel Sunny Beach. Hotel was spotless, rooms cleaned everyday, clean towels everyday, maids were pleasant and friendly. Breakfast not bad. Asked for a family room, but not much privacy. Pool area clean and tidy, if not early enough you couldn't get a sun longer, people puting towels on them and going away for the day. Won't recommend it if you have children nothing much for them to do except play pool which cost 12levs for an hour, table tennis costs 5levs for half hour and no kids club didn't see much of the Balkan rep lucky if we saw her about twice in the 2wks so more of the Thomson rep. Also there is no night time entertainment had to go out everynight. The hotel is situated on the main road again not ideal for children. Staff friendly and helpful. Overall hotel was nice, but won't go back there. Will go back to Sunny Beach in a few years time. Nice place not much litter lying about, just got to watch out for pickpockets. Myself and two friends stayed at Wela for one week, we are mid twentys and single. The only reason i would recomend not staying here is due to the walk into the centre every night, and worse the walk back in the morning. Friendly staff, the porter helped me to my room one night. I agree with the towel scam, we tried to get charged for a small towel but after a heated discussion the charge was dropped. We didnt see breakfast once so cant comment on the food but in general the hotel is very nice. Wela is a nice and quite hotel, idle for familys, pary people go somewhere else. I just spent two weeks at Wela and I´v never been so relaxt after a holiday like I´m now. Thank You!! Hi,just returned from one week in hotel wela,the hotel was really nice but beware when using their towels i had to pay 12lev for a towel that i am convinced the maid forgot too leave in my room, im not sure if there is a scam going on but i heard the same maid telling another couple they also had to pay for a towel that was missing from their room.